Posted by jeninmaine in Crafty, Etsy, sewing. It’s late, but I accomplished something! This was my first attempt and once I figured out how to do the voodoo to get the seams going the right way after turning one tube inside the other and forming the corners, it was pretty easy. The next one I make will take even less time. I have some pretty batiks for that one. It was fun! I need to prescribe myself fun stuff at least once a day. What a beautiful bag! What pattern did you use?? 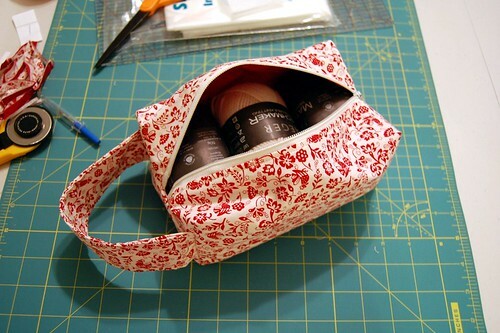 It looks perfect for carrying around my sock knitting. Hi Sally! 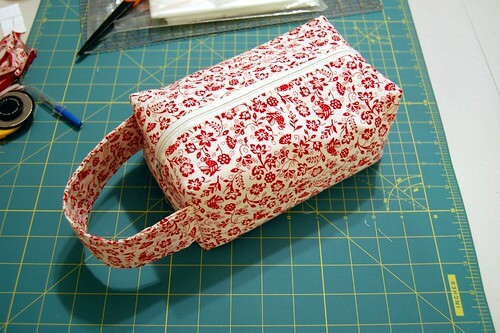 If you Google “box bag” there are about a billion tutorials out there. The basic design is pretty much the same, there’s actually not a lot to it – I ended up sort of improvising once I saw how it was put together. Easy peasy, definitely try it!